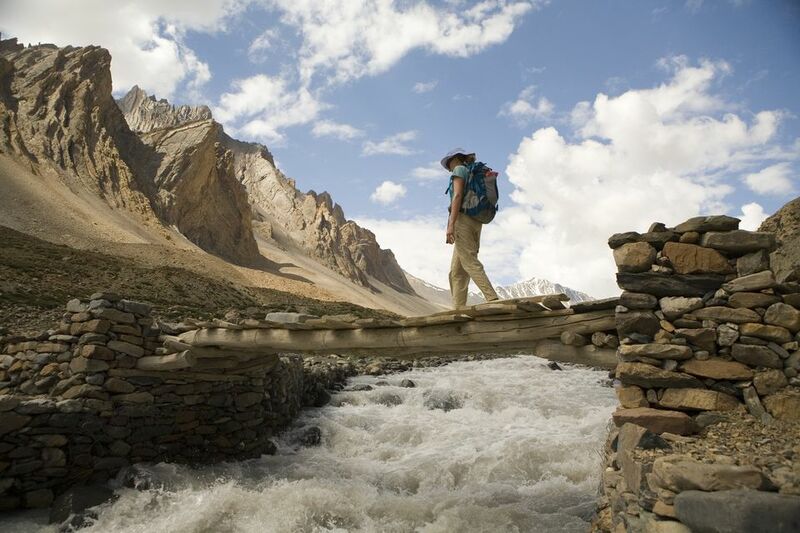 Adventure travel is hugely popular in India, as there is such a wide range of things to do. The Himalaya region is the setting for many adventure activities in India. However, there are plenty of options in the south as well! Here's what you can do and where. India's snow-capped peaks and wilderness to the north make it a delight for trekkers and mountaineers. Easy treks, difficult treks, long treks, short treks -- the options are almost endless! There's something for everyone, from an extreme 22 day walk along the frozen Zanskar River in Ladakh (Chadar Ice Trek), to a hike among the delightful The Valley of Flowers. For guided treks of all descriptions, some of the best companies are Ibex Expeditions, Peak Adventure Tours, Garhwal Himalayan Explorations, and Himalayan Frontiers. For a pristine mountain trek in Uttarakhand, head ​off the beaten path at Kalap. If you really want to get away from it all and like a challenge, try a remote trek that's still under the radar. Going on a rafting expedition in India combines picturesque scenery with exciting thrills and spills. Raft down renowned rivers, such as the holy Ganges, by day and camp at pristine beaches by night. If you have a real adventure on your mind, there's nothing like the extra adrenaline rush from whitewater kayaking. Companies providing these activities include Mercury Himalayan Explorations, AquaTerra Adventures, and ​GoaRafting. Where: The Himalaya region, including Ladakh, Himachal Pradesh, Uttarakhand (Rishikesh), and Sikkim. Also in Karnataka, Goa and Maharashtra. If you've wondered what it's like to fly like a bird, paragliding is the answer! There are two ways to go about it -- learn how to do it yourself or take a tandem joyride with a professional. Companies offering paragliding joyrides in India include Billing Paragliding Association, Fly Bir Billing, Wings and Flights, Nirvana Adventures, and Indus Paragliding. For those wanting to learn how to paraglide, Nirvana Adventures is the oldest and most reputed paragliding school in India. Temple Pilots is also highly rated. Where: Bir Billing in the Kangra district of Himachal Pradesh. Kamshet, between Mumbai and Pune, in Maharashtra. Traditional water sports such as parasailing, jet skiing, water skiing, windsurfing, and banana boat rides have been popular for many years in India. Newer activities, such as kite surfing, are now catching on as well. Imagine the rush from surfing while hanging onto a kite high up in the sky! Lessons are available for those who are inexperienced. It's possible to learn in 12-14 hours. Atlantis Water Sports is the most well-established provider. Where: Water sports are offered all along Goa's beaches. In north Goa, particularly around Candolim, Calangute, Morjim, and Arambol beaches. Also selected beaches in south Goa, such as Benaulim. Touring India on a motorcycle is the ultimate way of exploring the countryside if you have a love of traveling and motorbike riding. Enjoy the freedom to discover and experience India in a way which isn't possible using other forms of transport. For those who prefer a more extreme, competitive pursuit, there's The Raid De Himalaya -- an endurance testing week-long race of motorcycles and quads from Shimla to Leh. It's held during the first week of October. Where: All over the country, including the Himalaya region, Rajasthan, and south India. Did you know that it's possible for you to drive an auto-rickshaw across India? Known as the Rickshaw Challenge, Chennai Event Management Services operates around four of these madcap events a year. They're a hilarious, extraordinary way of experiencing India and seeing the Indian countryside​ while contributing to charity as well. Where: South India, through the states of Tamil Nadu, Karnataka, Goa, and Maharashtra. Where: Jaisalmer and Bikaner in Rajasthan. It's also possible to go on a camel safari in the alpine desert around Leh Ladakh, mainly in the Nubra Valley from Hundar to Diskit. The camels on these trips are the double hump Bactrian variety. Alternatively, for a really unique experience, opt for a yak safari! Where: Spiti Valley in Himachal Pradesh. Hot air ballooning is a relatively new adventure activity in India, but one that's fast growing in popularity. It's a thrilling way to experience India and get a different perspective of the country. Imagine having a calm and peaceful view of India's breathtaking scenery from a quiet place high above the crowds. Where: Goa. Jaisalmer, Jodhpur, Udaipur, Jaipur, Pushkar, and Ranthambore National Park in Rajasthan. Lonavala in Maharashtra, Hampi in Karnataka, and Neemrana near Delhi. Riding a bike amidst the peaceful surroundings of nature provides a special kind of pleasure for adventure lovers. The vastly varied topography of India ensures that there's wide scope for mountain biking, including plenty of tricky terrains. Ride individually or on a tour, an assault on your senses is guaranteed. Companies that offer mountain biking in India include Ecosphere Spiti and Mountain Bike Kerala. Where: Mainly in the Himalaya region. Also in the mountainous areas of Kerala, in south India. Take skiing to a whole new level and explore pristine, normally inaccessible terrain. You'll be airlifted by helicopter to slopes and mountain tops that are impossible to reach otherwise. Marvel at the virgin environment, and be the first to leave your tracks in the snow. Be warned, the thrill doesn't come cheap though! Himalayan Heli Adventures offers various heli-skiing trips. The season runs from January to April. Where: Himachal Pradesh (based in Manali) and Kashmir (based in Srinagar).